The actual tennis racquets she used in winning Wimbledon and the U.S. Nationals are displayed at the UM Sports Hall of Fame. MIAMI (AP) — Tennis great Doris Hart, who won each Grand Slam tournament at least once, and once won three Wimbledon titles in a single day, has died. Hart died Friday at home at the age of 89, the International Tennis Hall of Fame confirmed to The Associated Press, citing close personal friends of Hart's. Hart was known for her smarts, crisp groundstrokes and drop shot mastery. She won titles in 1954-55 at the U.S. Championships, which later became the U.S. Open. She won the French Open twice and Wimbledon and the Australian Open once each. She also totaled 29 major doubles titles and ranked No. 1 in the world in 1951. That year, Hart had her finest tournament at Wimbledon, when she won three titles. 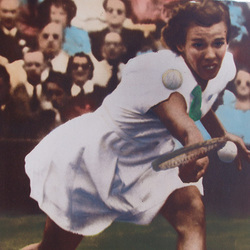 She defeated friend Shirley Fry in singles before they joined forces to win women's doubles. She then teamed with Frank Sedgman to win mixed doubles. All three matches were on the same day because of rain delays. "That I think is unique in itself," said 86-year-old friend Jacqueline Mulloy, who met Hart 12 years ago through husband and former tennis player Gardnar Mulloy. "I think she should be remembered as a unique and wonderful player. She had plenty of guts." Donna Fales, 74, an accomplished amateur tennis player, said she met Hart after moving to Florida in 1969. "She is someone I looked up to," said Fales, 74. "She was a great champion and great competitor with great integrity; a wonderful representative of the sport." Hart was in the world Top 10 for a decade starting in 1946. She retired in 1955 and was inducted into the International Tennis Hall of Fame in 1969. Success didn't come without adversity. Hart suffered an infection as a child that was serious enough for doctors to consider amputating her right leg. However, she started playing tennis at 6 and won 35 professional titles. "Everybody thought she had polio, because she was a little bowlegged," Fry told The Associated Press in 2004. "For her to do what she did was special because she couldn't run as well as other people. And yet she had the smarts." Hart was born June 20, 1925, in St. Louis and grew up in Coral Gables. She attended the University of Miami, a few miles from where she lived in recent years. As a player, her best weapon was the drop shot, which she practiced endlessly as a youngster. She would hit it even from behind the baseline, floating winners just over the net. "I'd be criticized," she told The Associated Press in 2004. "I can remember losing matches, and people would come up to me and say, 'Girl, do you know how many times you missed that drop shot? If you hadn't done that, blah blah blah.' And I'd say, 'Thank you.' But I knew I had to do it. That's what would win for me." After she retired, she worked as a teaching pro for 28 years at a club in Pompano Beach, but neck trouble forced her to give up tennis in 1993. Later in life, she shunned the pro tennis scene, though she did watch matches on television. She never married. In January 2010, she told the AP that she had lost most of her vision. In 2004, watching the U.S. Open in her apartment, Hart cringed at Serena Williams' clothing ensemble, marveled at the smooth shot-making of Roger Federer and said she disliked the way most players try to hit everything so hard. "There's really not much strategy involved," she says. "It's not that appealing to watch, I don't think."